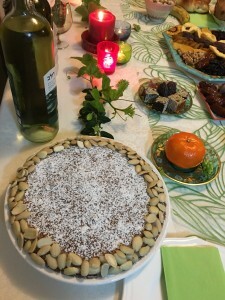 This is a delightful tart to serve at a Tu B’Shvat seder meal, where all the fruits of Israel are celebrated and enjoyed. The almond tree is the first to blossom in Israel after the cold winter. The beautiful blossoms, therefore, are the welcome herald of Spring. Or: sprinkle some icing sugar on finished tart and decorate with shelled almonds. Crust: mix all ingredients to form a soft dough. Line a 32cm pie dish with the dough. Prick the base and chill until cold. 1. Combine almonds, sugar and butter till light and creamy. 3. Stir in cake flour gradually. 5. Spread the jam over the chilled unbaked crust and spoon the almond filling on top. 6. Bake for around 1 hour. Remove from oven and cool. Blend the icing sugar and boiling water and a few drops of lemon juice to form a glace icing. Spread over the tart and leave to harden. Now, enjoy! Betayavon! Good appetite! Sounds good. Will try this one too.